Jalen Davis grew up being an all around athlete. He started following in his father’s footsteps by playing T-Ball and football at the age of four. He knew immediately that sports intrigued him and he wanted to go far. At six years old, he started running for a local track team in Santa Clarita called The Storm. Davis soon became known as the fastest runner in the Western Conference Valley Youth Organization for his age. As he got older, Davis began to join postseason teams to try and earn a spot at the Junior Olympics. In the summer of 2017, at the age of 13, Davis qualified to go to the JO’s in Sacramento. He took fourth place in the 100m with a time of 11.3 seconds and seventh in the 200m finals with a time of 23.7 seconds. Before entering high school, the head coach of the program knew he saw something special in Davis. Coach Lonnie Davis, who happens to be Davis’ father knew he had something special in his son. “I’ve seen him grow and develop as a sprinter over the years and I’m excited for his future at Golden Valley,” said coach Davis. 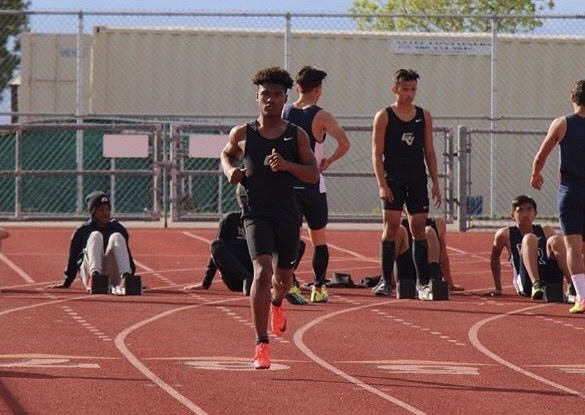 Due to his excellent times, Davis is presently one of the top two sprinters as a freshman for GV track team. With the first league meet under his belt, Davis proved he belonged as he won both the 100 and 200 to earn his team valuable points as the Grizzlies defeated the Wildcats. Davis has been taking this season very seriously after coming back from an injury during preseason. The hip injury he had caused him to miss an entire month of training. Once he got back from the injury he has trained very hard to get his speed back and make sure he’s prepared for this upcoming season. Davis’ goals for his first high school track season are to run a 10.6 in the 100m and a 22.3 in the 200m. He plans to keep on working to get faster and prove that he belongs at the varsity level. Having a freshman as one of the fastest runners on the team has pushed the upperclassmen to work harder during practice. This has created a non adverse environment for the team as the upperclassmen actually look up to him with respect for being the fastest on the team as a freshman. For some coaches, having their own kids on the team can make things difficult. However for coach Davis, being the track coach makes it pretty easy because times don’t lie. After the first league meet Davis not only proves he belongs, but also raises the expectations for both father and son.